Withered Hand Cultist is an epic Strength creature card. It is part of the Core Set. "A dark omen for you!" "You have met your end!" "Enjoy the next life, fool." 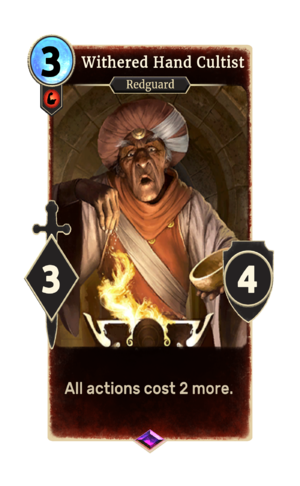 The card is, perhaps unsurprisingly, named for the Withered Hand cult in ESO. This page was last modified on 14 February 2019, at 00:37.